Enjoy Gerald McRaney in the press room, video from 09/10/17 where he is answering questions about his well deserved win that was due for many many years for such an outstanding actor like he is. 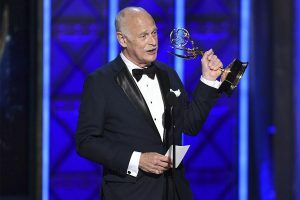 Gerald McRaney won Best Drama Guest Actor for ‚This is Us‘ at the 2017 Creative Arts Emmys for his role as a compassionate doctor in the NBC drama series. What’s most shocking about his victory is that he had never won before, or even be nominated, in his illustrious career. Watch him talk to press backstage after accepting his award.